Samford University’s Center for Science and Religion will host two free public lectures in March. Josh Reeves, assistant professor of science and religion at Samford, will present “Can Scientists Be Trusted? 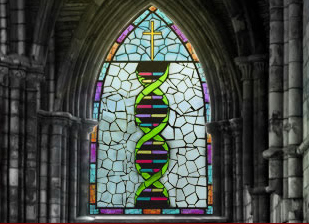 Understanding Christian Skepticism Towards Science” March 1 at 3 p.m. in Reid Chapel. Reeves is coauthor (with Samford math and computer science professor Steve Donaldson) of A Little Book for New Scientists: Why and How to Study Science. He also has published numerous articles in publications such as Theology Today, Zygon and Theology and Science. He is working on a new book, Redeeming Expertise: Why Christians Should Take Scientific Experts Seriously. Before joining Samford’s faculty, Reeves served as a grant project administrator in Samford’s Center for Science and Religion. In that role, he managed the New Directions in Science and Religion project, which brings constructive science and religion dialogue into the church. Before coming to Samford, he completed a two-year postdoctoral fellowship at the Heyendaal Program on Theology and Science at Radboud University in the Netherlands. Jeff Schloss, T.B. Walker Chair of Natural and Behavioral Sciences and director of the Center for Faith, Ethics and Life Sciences at Westmont College, will present “Lions and Tigers and Bears, Oh My! Three Big Questions in Evolution and Theism” March 27 at 7 p.m. in Reid Chapel. Schloss earned his bachelor’s in biology from Wheaton College, a doctorate in ecology/evolutionary biology from Washington University, and completed a postbaccalaureate field study at the University of Virginia Mountain Lake Biological Station and the University of Michigan Douglas Lake Biological Station. He often speaks to public, church-related and secular academic audiences on the intersection of evolutionary science and theology. Among his many academic publications are The Believing Primate: Scientific, Philosophical and Theological Reflections on the Origin of Religion, which he edited with philosopher Michael Murray. Schloss has participated in a number of invitational collaborations on topics in evolutionary biology, emphasizing various aspects of what it means to be human. He has held fellowships at Notre Dame University’s Center for Philosophy of Religion, St. Anne’s College at Oxford University, and Princeton University’s Center for Theological Inquiry. He serves on the editorial boards of several journals, including Theology and Science, Science and Christian Belief, and Religion, Brain and Behavior.